Pursuant to the Higher Education Opportunity Act (HEOA) of 2008, Macomb Community College makes the retention rate of certificate or degree-seeking, first-time, undergraduate students available to prospective and current students. According to the Integrated Postsecondary Education Data System (IPEDS) definition, the percentage of first-time students who began in Fall 2016 and returned in Fall 2017 is 67%. IPEDS data represents approximately 2% of the students enrolled at Macomb. 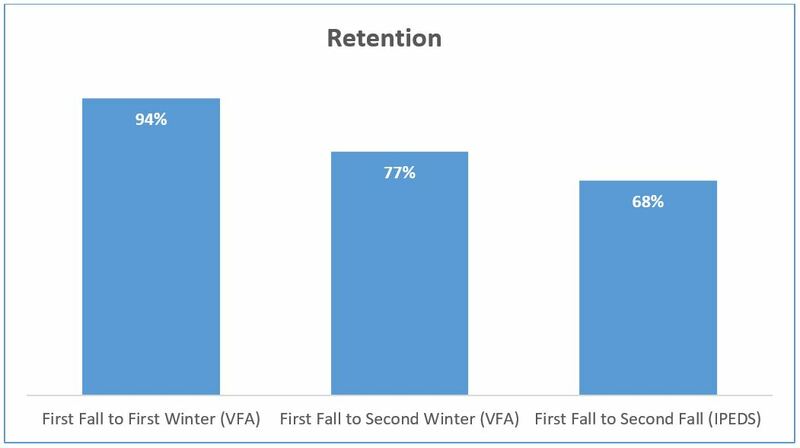 According to the Voluntary Framework of Accountability (VFA), the percentage of incoming students who began in Fall 2014 and returned in Winter 2015 is 93%, and the percentage who were still enrolled after two years is 77%. The VFA measures include a larger percentage of the student body, approximately 9% of the credit students who attend Macomb annually.